Nouveau Paris Monumental Inineraire Pratique de L'Etranger Dans Paris. 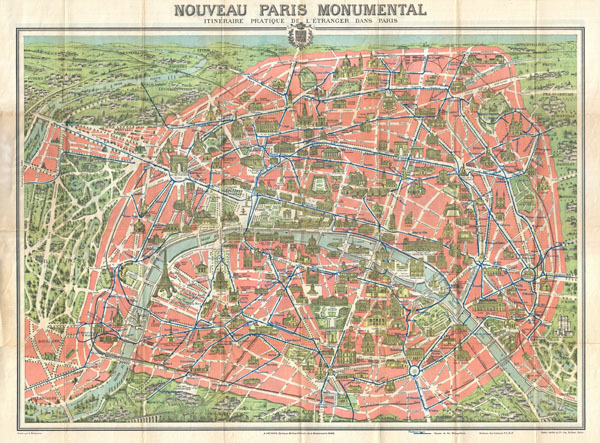 A highly decorative map of Paris dating to c. 1910. Covers the historic center of Paris as well as some of the surrounding countryside - in particular the Bois de Boulogne. Designed with the tourist in mind, this map shows all major monuments and historic attractions, including the Eiffel Tower, in profile. Train and tram lines are noted in blue. Folds into original art nouveau style red binder which also contains a short guide to the city in English, French and German. Very good condition. Original fold lines exhibit minor wear. Attached to original red cardboard guide and binder. Map of Paris and Environs on verso.